Sword and Scimitar begins July 1545 in the Mediterranean. Young Knight Thomas Barrett has been left in charge of the galley, Swift Hind, while the Captain and four soldiers are checking out the Turk merchant ship anchored at the other side of the bay. We find out about the Order of St John and the protection that offers them from corsairs. There is friction between Thomas and Knight Oliver Stokely which is a theme throughout the story. It’s not long until we’re into the action with an exciting fight with two corsairs as well as the Turk merchant ship. Thomas has been left to clear up the ship and take it back to their base at Malta. It’s whilst clearing up that Oliver and Thomas find something that determines the course of their rivalry and Thomas’ exile from the Order. 19 years later, Thomas is at Barrett Hall in Hertfordshire. We find out what has happened during the intervening years, his family background and their demise. Thomas receives a message from the Order to return for what was to become known as the Great Siege of Malta. The next day another messenger arrives from Sir William Cecil and we find out that Thomas has a mission as well as re-joining his Order to fight. Accompanying him will be one of Sir William Cecil’s men who to all intents and purposes will act as his Squire. What follows is Thomas’ journey back to Malta and the ensuing siege. I enjoyed the historical aspect of Sword and Scimitar. I always love ‘watching’ history come to life which it certainly does here! Thomas is a character who is easy to identify with. Life’s experiences have given him a balanced and practical view so he isn’t as zealous as others in the Order. He is solid and dependable and someone you’d want by your side, no matter his maturity. Love is another thread running through this story, both romance and familial love. Conflict comes from Oliver as well as the conflict of sword against scimitar. There is a lot of tenseness and excitement from the fighting which is descriptive. You really feel as if you are there. I actually enjoyed the blood and gore. The only downside for me was the repetition of the fighting and yes, I know that is what happens when there is a siege but I did lose interest at one point. In the Author’s Note at the end, we find out there is a museum in the Grand Master’s palace which has gone on my list of places to visit – I would love to sail into Valetta harbour and imagine how it was. Finally, there is an interesting Q & A with the author. 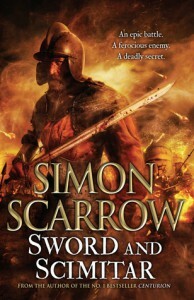 I read Sword and Scimitar as part of the Real Readers Programme.